A trendy-looking website and regularly updated blog – this is the first thing that attracts your attention when you open the website of a service called EssayWritersWorld.com. If you look a bit closer, you will find that this company offers a lot more – ‘certified custom writers’ and ‘A+ or A assured grade’. The second promise is a difficult one to fulfill, so we decided to investigate the company and see if this is the best choice for your academic papers. The range of services offered at Essay Writers World is exhaustive, including all commonly requested papers and papers that are more difficult to find, including capstone projects and financial analysis papers. Offering such a variety of papers means that the company has to work with hundreds of writers, especially if they truly deliver papers that are worth an A+ or an A. We cannot tell you the lowest price this company offers since they do not have a pricelist on the website. However, you can use the calculator to check the quote for your paper without having to sign in or add any personal information. Once we checked the calculator, we concluded that prices at Essay Writers World are very steep for a student’s budget. A single page for a high school level essay with a deadline of 10 days costs $19.94, and this is if you choose the ‘no citation’ option. 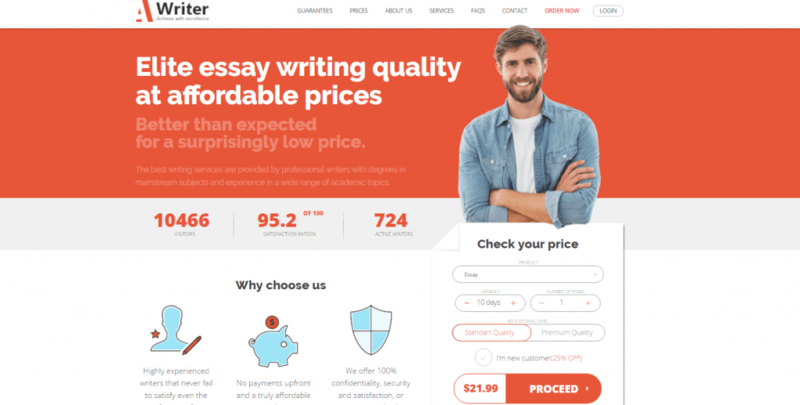 This is a very high price when compared to prices on the writing market, especially since it applies to the lowest academic level and the furthest deadline provided. As for the discounts the company offers, the information on the website is very confusing. Even though they do have a Discounts page, this page contains a lot of irrelevant content and no specific information about their discounts! Apparently, you can only calculate your discount if you add personal information and information about your paper. Once we did this, we were highly disappointed to know that we get only $1 discount on the price that applies for an essay page! We thought ‘perhaps this is a service worth your money if they truly deliver A+ or A grade papers’, even though the prices were extremely high for a student’s budget. What we got was a high-quality essay, but we would not say it was a sure A, nonetheless an A+. We would grade the essay with a B or perhaps even a C, if the professor who assigned it were strict about referencing or formatting. As for the customer support, this part disappointed us the most. The company has a live chat, but no one replied to our question about discounts, even though we waited for half an hour before placing the order. EssayWritersWorld.com is a legit service, but has many flaws and disadvantages. Even though they offer a wide range of services and deliver quality papers, the lack of a loyalty or discount policy, their steep prices and a horrible customer service make us believe that this is not a service worth your time or your money.